I feel like all of my pages have been gold-centric lately! This one comes with a Saint Patty’s Day twist; lots of green! I started with basic white card stock and layered green and cream chevron paper by The Paper Studio. Pale green textured card stock adds interest without making the page too busy. While I used some green embellishments around the title and photos, my favorite part of the page is the hand-sewn bead and sequin embellishments on top of the green card stock. 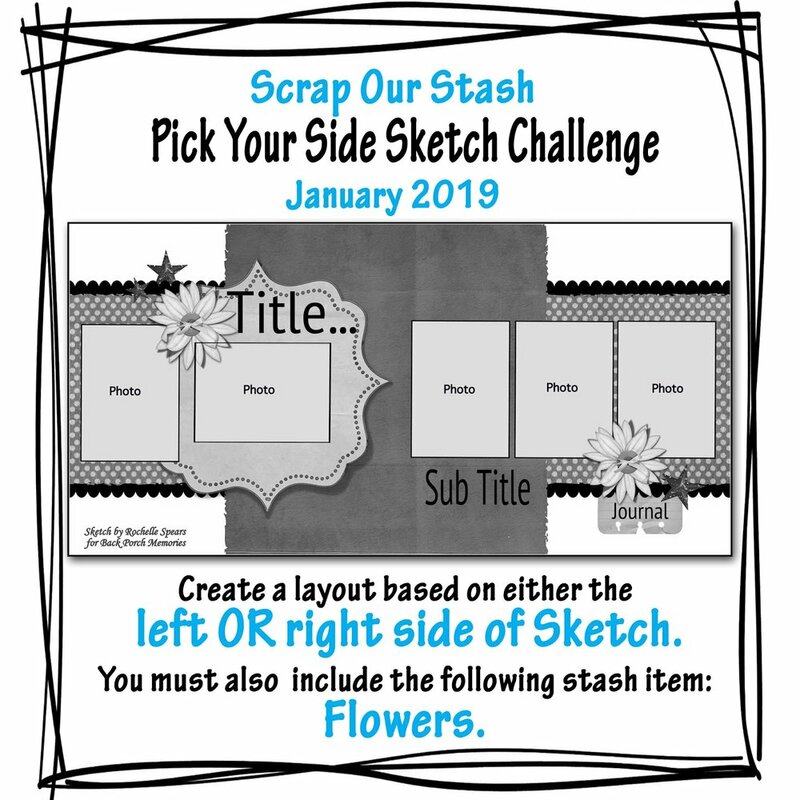 This layout was done for Scrap Our Stash’s March challenge which is inspired by March’s biggest holiday! I drew inspiration by using varied shades of green in both paper and embellishments, and lots of gold too! I used 2 photos instead of the 3 shown on the sketch. I loved the way the colors in the photos went with the rest of the layout! The holidays have come and gone and now we’re starting a whole new year! Can you guys believe it’s 2019?? The majority of the photos in my stash are taken at sunny beaches, both local and abroad, but I was able to find this snowy photo which seemed fitting for a January layout. It was take in September several years back on the drive home from Yosemite and an unusually early snow storm had just come through the area. I used blue-gray card stock from Paper Studio’s Affinity card stock stack and used one inch strips of wood print paper from Paper Studio’s Dendrology stack to create an alternating pattern. I finally had an occasion to use my 6 X 6 Altitude stack by Bo Bunny which included the beautiful blue and white snowflake paper used. I used some vellum and metal square frames from JoAnn’s and decorated them with epoxy snowflake charms by Making Memories. Several years back, I bought an enormous mixed bag of buttons from Michael’s and keep finding uses for even the most random buttons, including the cute little deer and hedgehog on this page. The color palette and winter theme for this page comes from Creative Embellishment’s January Challenge. 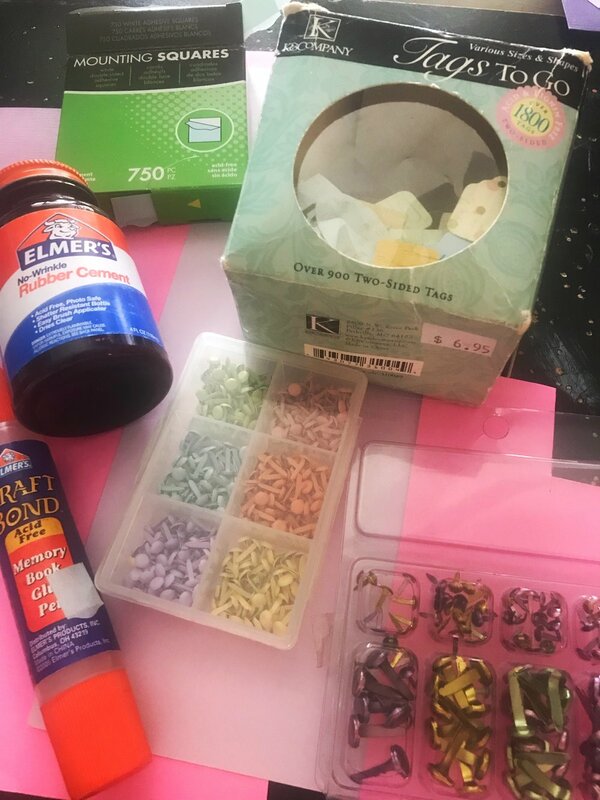 I was looking for pine cones of some sort in my stash but unfortunately couldn’t find any, but I did utilize some snowflake items I had as well as the wood grain paper. 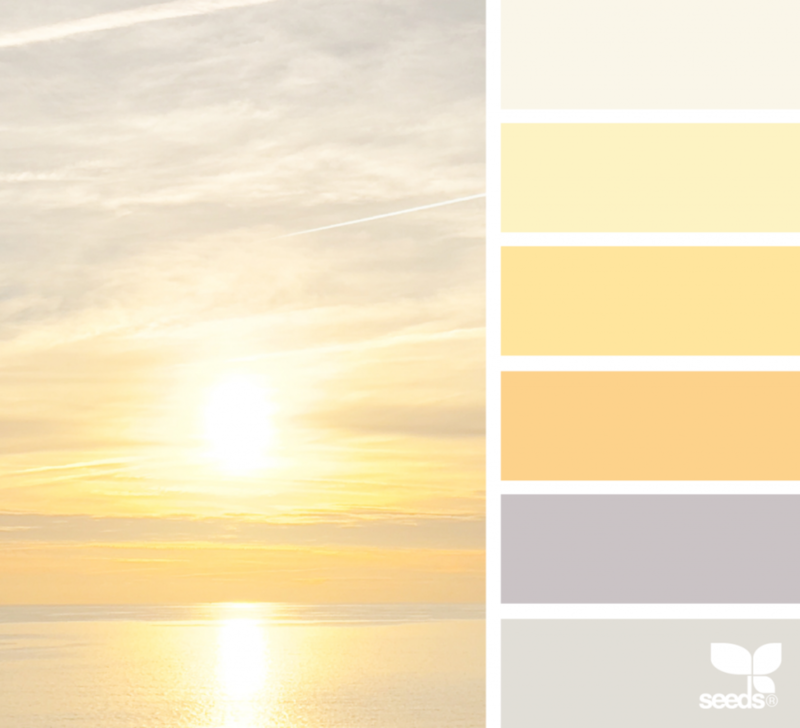 I also based my color theme on the mood board, sticking to blues, bronzes and pink-toned grays. This layout comes from Let’s Get Sketchy’s January Challenge. This layout was was perfect for the single, landscape photo I had. I embellished further with mini tags by K & Company, adhesive rhinestones and silver coated leaves. That’s all for this time. I wish you all happy scrapping and a happy new year! In making this page I played a game called “How Much Gold Can I Fit On A Page?” It’s hard to tell in this photo but there’s loads of metallic gold accents that make this page positively blinding. 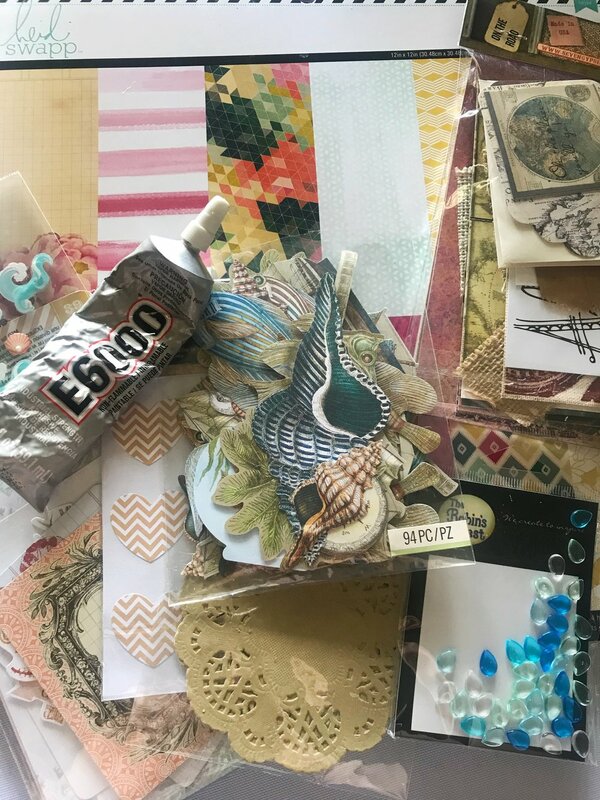 I started with basic white card stock and used pink ad mint geometric paper from the Paper Studio’s Mint To Be Fab stack along with metallic gold washi tape. Corresponding mint and pink card stock and gold polka dot paper made for fun layered photo mats. I used all the gold embellishments I could find like seashell washi tape by Little B and glittery tags by Pink Paislee. I used gold heart stickers by Stick-a-bilities to add more interest to small vellum tags and I just happened to have a golden metal owl who makes a very cute addition to this page. This month’s layout comes from Let’s Get Sketchy’s December challenge. I rotated the sketch 90 degrees and elaborated on the heart motif. This page was done for The Studio Challenges’ December Challenge which was, of course, to use gold! I enjoyed digging all the gold odds and ends out of my stash, some of which never seemed right for a page until now.